Your fleet drivers are at a higher risk of being in an auto accident, and those accidents are more likely to cost more than the average accident. The increased risk comes from the fact that your fleet drivers are simply on the road more than the average driver; about twice as much, actually, which most fleet drivers clocking an average of 25,000 miles per year. Not only is the frequency of the accident higher, the cost of the accidents seems to be higher as well. The average non-fatal accident within your fleet will cost you, on the lower end of the scale, around $20,000 and as much as $75,000. A fatal accident can run into the hundreds of thousands of dollars. In total, businesses are losing billions of dollars every year to vehicle crashes. But why are vehicle accidents so expenses to companies? 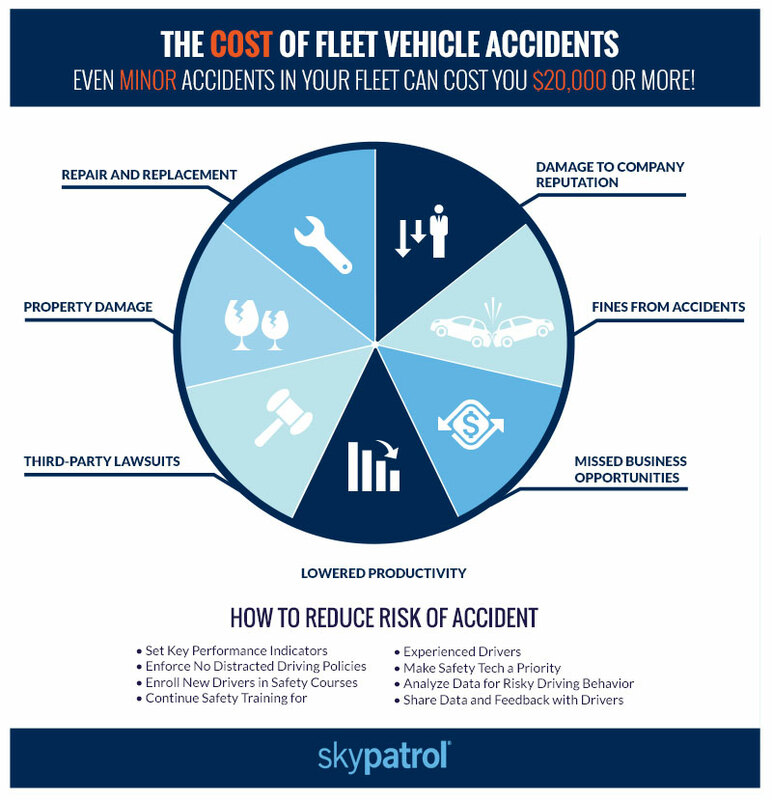 What are all the associated costs of an accident within your fleet? Let’s break it down. Where Are Accidents Costs Coming From? If the accident involves another party, your business is going to be paying for the repairs or replacement of the vehicle or other property that’s been damaged. While your insurance will kick in to cover some of those costs, you’ll still be holding the bill for the deductible and there is a good chance your insurance premiums are going to go up, too. Lawsuits after an auto accident are extremely common, especially if there have been injuries. These liability claims can end up costing your company a lot of money, even if you settle. Court costs, settlement fees, and paying a lawyer all add up fast. If the lawsuit starts to get publicity, that can mean even bigger losses to your company and potentially a much bigger settlement. If you don’t settle, some injury cases can drag through the court system for years. There is a good chance that your driver will need to miss work after an accident, especially if they’ve been injured. Some workers may end up not being able to drive anymore at all; that means a worker’s compensation claim as well as needing to replace them. Both of these take time and money. You’ll also need to take time away from other tasks to evaluate the damage to the vehicle, contact the insurance company, and arrange for repairs. This is a distraction from tasks that could be making your business money. When a vehicle is in an accident, the tasks that needed to be done that day are going to be delayed until you can reroute and alert other drivers. When your fleet numbers have been reduced after an accident, you could end up missing out on potential business opportunities simply because you don’t have the resources necessary. This can lead to bigger long-term losses. You could get hit with tickets, court fines, and other fees after an accident. Your company will, more likely than not, be responsible for paying all of those fees and fines. If you are hit with a lawsuit, the fines will add up even faster. Your company’s reputation matters; it’s what drives word-of-mouth marketing in your favor. If a big accident ends up making your company look bad, the repercussions can be massive. You could lose out on revenue from new business and end up spending a lot of your marketing budget trying to undo the damage. When your drivers have the company logo on the side of their vehicle, that means every photo or video of the accident scene is going to be free bad press for you. You are going to need to replace or repair the vehicle that was damaged in the accident. Depending on the severity of the accident, that could end up costing you thousands of dollars, not to mention lost productivity. Replacing a vehicle isn’t normally as easy as taking a quick trip to the local dealership, either. You’ll need to make sure the vehicle that you purchase has the right features for the job, can meet the demands of a fleet vehicle and has the safety equipment that your drivers need. Plus you’ll need to arrange for financing and insurance, both of which can take time. The best way to reduce the cost of an auto accident within your fleet is to reduce the number of accidents that are occurring altogether. There is no way to do this entirely; sometimes accidents just happen with no fault on the part of your drivers. The majority of accidents are preventable, though, and those are the ones that you’ll want to target. Set key performance indicators. These key indicators can help you enforce company policies and keep drivers on track for safer performance. It can also help you reduce fuel expenses and set expectations for performance. Enforce no distracted driver policies. Distracted driving is one of the main culprits of road accidents. Require drivers not to use their cell phones in the vehicle or eat while driving. Review GPS and driving data to look for signs that these rules aren’t being followed. Enroll new drivers in safety courses. Training drivers from the start to be as safe as possible can help keep them out of an accident later on. Make safe driving courses a requirement for new drivers before they hit the road. Continue training for experienced drivers. Some studies have shown that drivers who have been in your fleet for more than a year are more likely to get in an accident than new drivers. Keep training drivers in order to keep safety rules fresh in their minds. Don’t let complacency put your company at higher risk. Make technology a priority. New technology is available that can make both your cars and your drivers safer. Tech like back up video cameras, automatic braking, and GPS tracking are all available on new vehicles and can be a literal lifesaver. The more you can utilize technology, the safer you can keep your drivers and lower the cost of an accident. Analyze data for potential risky driving behavior. If you are using fleet management software, use the data that it provides to analyze drivers performance. This data can help you see patterns of risky behavior or pinpoint areas where drivers can improve. If you aren’t sure what safety indicators to look for, work with an expert who can help you spot patterns and take steps to correct risky behavior. Share data with your drivers. Drivers often think they are safer than they actually are. Show them the data from their vehicle so they can see the numbers for themselves. It can be a wake-up call about risky behavior that could end up helping them stay safer on the road. Is your fleet lacking the data you need to help you reduce the costs associated with an accident? Fleet Command can help. Our GPS solution is made for small to medium-sized fleets. It gives you information on driving habits, helps you ensure drivers are adhering to policies, and encourages drivers to maintain safe driving habits. Set up a demo with our team today to learn more about how Fleet Command can help you lower expenses while keeping drivers safer on the road.